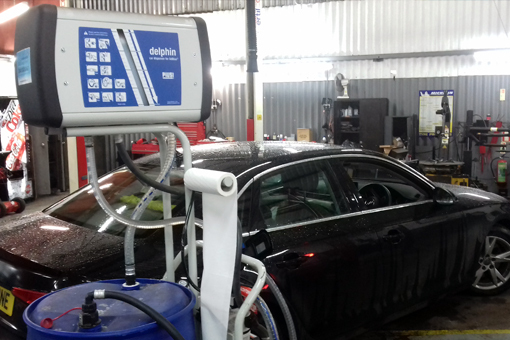 Following the introduction of AdBlue to the car market, franchise dealers are required to have a facility to fill cars with the solution safely. Most manufacturers rely on small-pack plastic containers but this not only creates a large amount of waste packaging but also increases the possibility of spills. Southern Lubricants and our AdBlue supply partner have created a solution that cuts waste, spills and ongoing costs. Our electric dispensing machine carries an AdBlue barrel on a trolley, which can be wheeled easily around a workshop and used to fill any car any where AdBlue is required. We offered the electric dispensing machine to one of our customers, a Vauxhall dealer, to trial and performed training for the workshop staff. They found that by using the larger barrels over the smaller packed product, significant cost savings were made, which effectively paid for the dispenser in 12 months.